The Sacramento TMA is the oldest TMA in Sacramento and one of the largest in the country. Incorporated in 1989, the TMA has 205 members, representing more than 90,000 commuters. The Sacramento TMA serves employers, commuters and residents from the American River to Elk Grove and from the Sacramento River to 65th Street. The TMA is an independent association of employers and building managers that are concerned about traffic congestion and air quality in Sacramento. By pooling the members’ resources, the TMA helps its members offer employee commute programs that are more comprehensive, more cost-effective and more successful than any employer could offer on its own. Business and community leaders on the Board of Directors set TMA policy and direction. The executive director develops and provides member programs and services. Marilyn Bryant has been executive director of the TMA since 1990, providing consistent transportation assistance targeted to members' needs. Involved in Sacramento's business and transportation community for 30 years, Bryant shares her information and expertise with TMA members, saving them valuable staff time to devote to their primary business. The Sacramento TMA is funded by membership dues, which pay for member programs, services and staff. The TMA leverages these dues to secure grant funding for programs and services. Sacregion511.org. The online site that provides information to all commuters, whether they drive-alone or use an alternative travel mode, an effective way to reach commuters and make a significant impact on their transportation choices. Emergency Ride Home. Employees that don’t drive alone to work have a taxi or rent-a-car and aren’t stranded with no way to get home or to their child’s school. TDM Training. At monthly networking meetings, the TMA acts as a clearinghouse of ideas, shared information and resources. From presentations by the TMA and expert speakers, attendees learn how to offer TDM programs and understand the background and importance of reducing vehicle miles travelled in the region. “Office Hours: information tables. Onsite, personal assistance and support with how to use TMA programs and find alternatives to driving alone. Seasonal and corridor-specific campaigns. 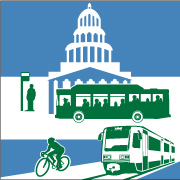 Working in partnership with SACOG, (Sacramento Area Council of Governments), the TMA presents campaigns to promote alternative travel modes. The TMA keeps members informed of changing transportation and air quality issues, tracks activity and keeps members updated with information they need to know through on-going training and special assistance implementing commute alternative programs at the work site. At monthly networking meetings, the TMA acts as a clearinghouse of ideas, as Commute Coordinators share information and resources.